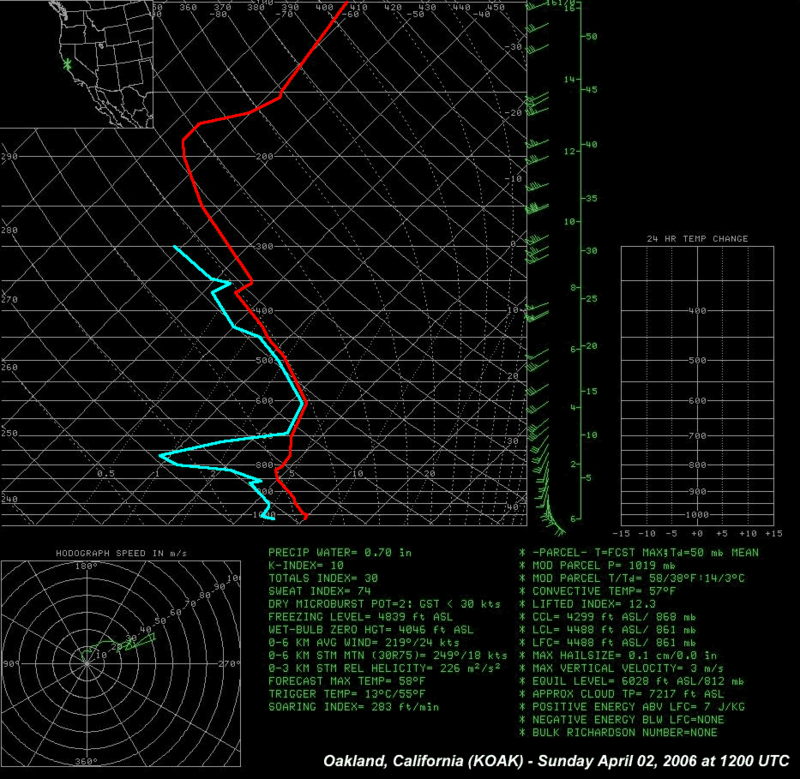 With conditions already primed by a wet winter and much above normal March precipitation, a prolonged storm period stretching from Sunday, April 2nd through Thursday, April 6th, 2006 brought renewed flooding to California. This time, the target was the southern Sierra Nevada and the San Joaquin Valley. 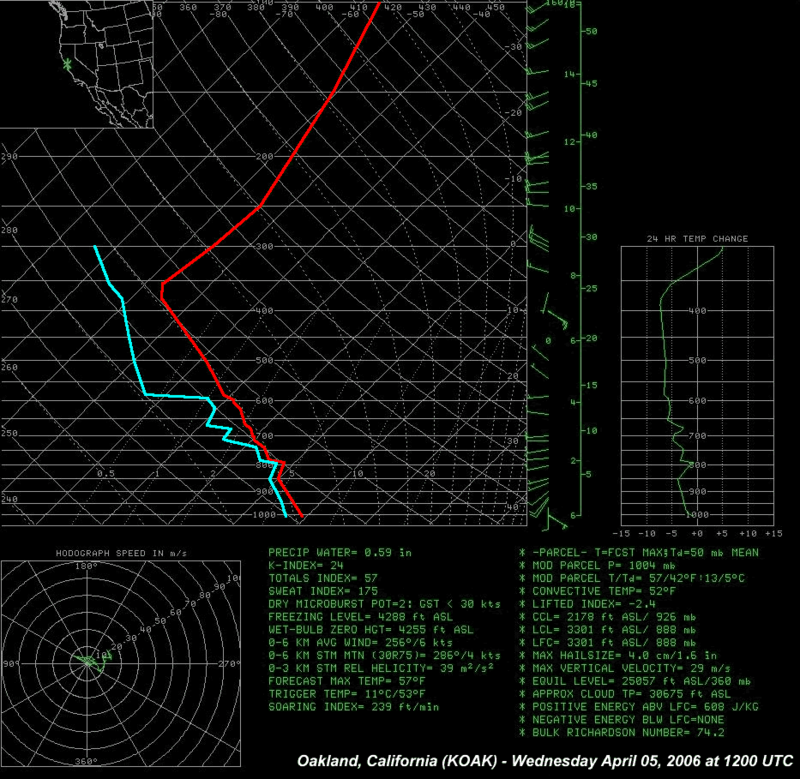 While the source of this system was cold, originating in the Gulf of Alaska, the southwest flow that developed in advance of this unseasonably deep upper trough drew very mild moist air from the subtropics into central and southern California. 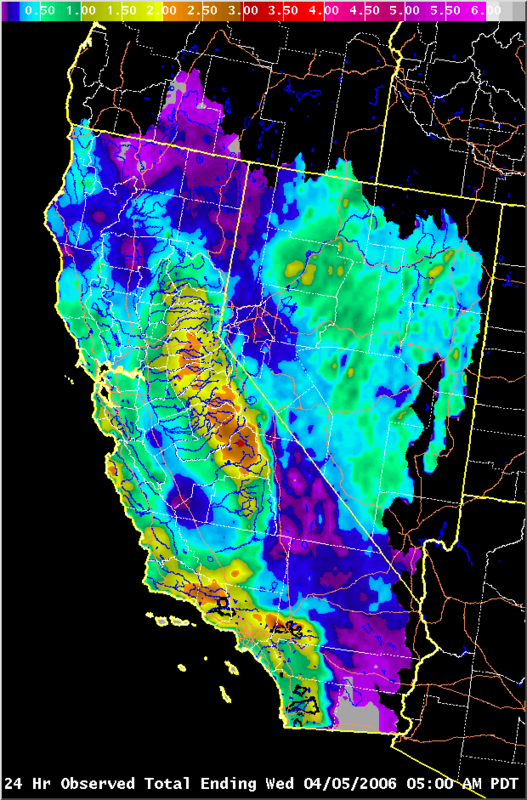 This warm moist air and sustained upslope winds into the southern Sierra Nevada resulted in excessive precipitation; and high snow levels only worsened the situation with additional runoff contribution from the upper portions of the affected basins. As the events unfolded, several of the southern Sierra Nevada reservoir projects were put in the precarious position of balancing large reservoir inflows and vanishing flood storage space with downstream releases with hopes of preventing or at least minimizing damage to the fragile San Joaquin River levee system that carries water to the Delta. Similar conditions were experienced farther south along the Sierra Nevada that drains into the Tulare lake bed at the south end of the San Joaquin Valley. While the bulk of the flooding affected agricultural and rural properties, some local areas adjacent to waterways did experience flooding of homes as well as many roads becoming impassable. However, through the efforts of advance flood-fight measures, careful monitoring of levees, as well as critical water management coordination among state, federal and local agencies, the system performed as designed and more serious flooding was averted. 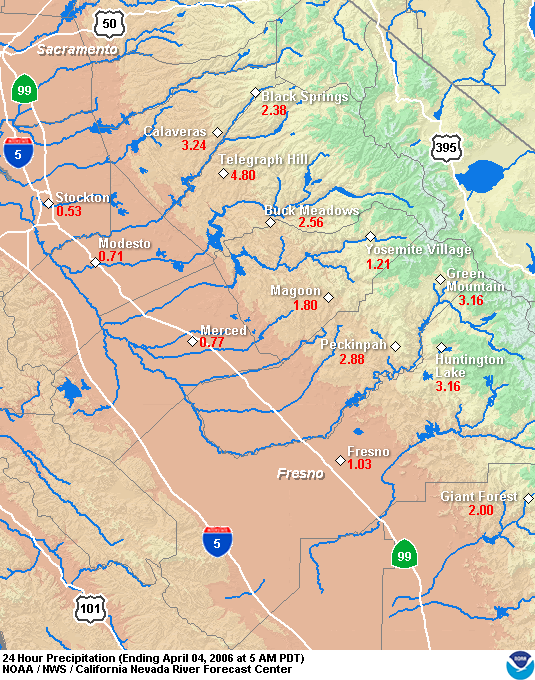 The storm did affect areas outside of the southern Sierra Nevada and San Joaquin Valley, with high flows noted on the Salinas River of central California. Heavy rains also occurred along the tranverse mountain ranges of southern California, with high flows occurring on the Santa Ynez River from releases out of Lake Cachuma. 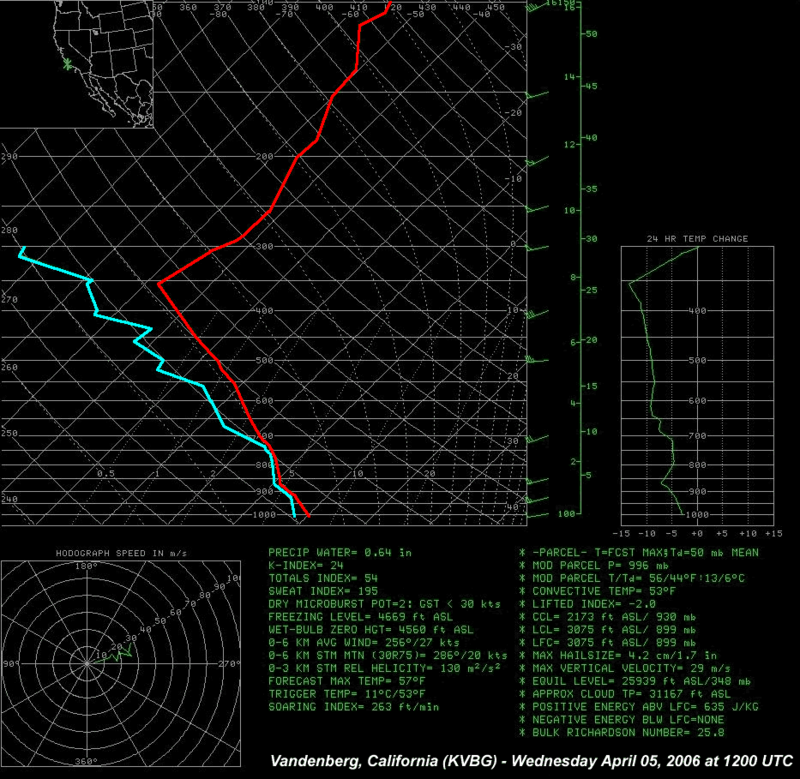 A follow-up storm, initially looking very similar to what had just occurred in the first week of April, threatened to repeat heavy rains across central California about a week later. Fortunately, a minor but critical westward and later southward shift in the storm track focused its heaviest precipitation through the San Francisco Bay Area northward to Shasta Lake. 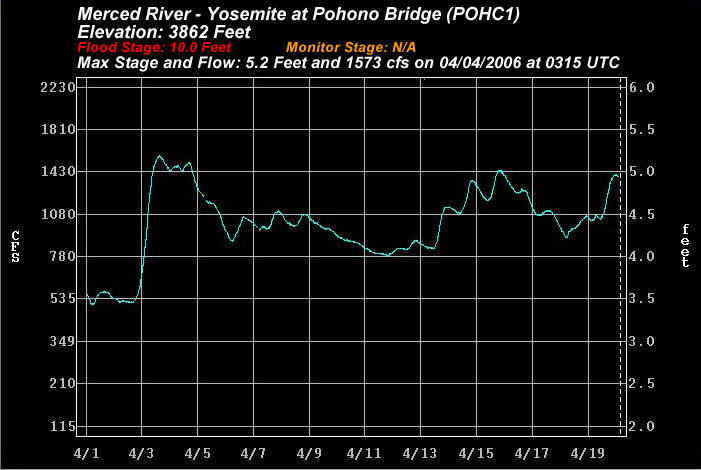 This brought renewed rises to the Russian and Napa Rivers but river levels remained below their monitor stages. Fed by runoff from streams along the west side and north end of the Sacramento Valley, the Sacramento River also saw some rises above flood stage and these high flows boosted already high weir overflows into the Sutter and Yolo Bypass system. In addition, the weeks of heavy rainfall culminating with the storms of early April were blamed for several mud and land slides, including the death of a Marin county man who was buried while working outside on his yard's drainage system when the adjacent hillside gave way. After the significant precipitation event that brought widespread flooding to parts of southwest Oregon, northern California, and western Nevada around the new year, a relatively quiet period of weather developed across the entire region. However, a shift in the weather pattern toward cooler and wetter took place at the end of February. A series of systems developed in the Gulf of Alaska and tracked southeast toward northern and central California. This pattern remained rather persistent for nearly one and a half months, bringing above normal precipitation and below normal temperatures to the region. 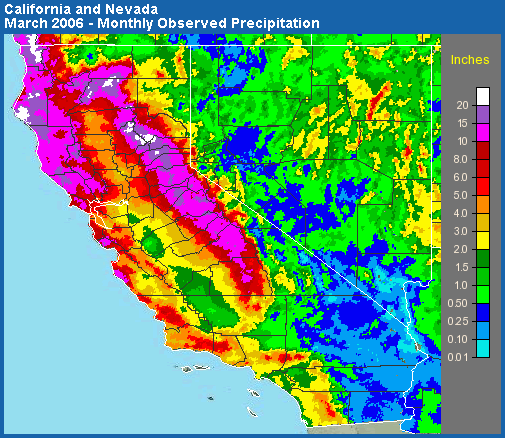 Storm after storm affected northern and central California during the month of March with very few breaks, allowing precipitation totals to finish well above normal. [March Monthly Observed Precipitation Graphic and March Percent of Normal Graphic] In Sacramento, the record for the number of days with at least .01 inch of precipitation was broken as the city received .54 inch on the last day of March. The new record of 20 days broke the old record of 19 days last set in the year 1989. 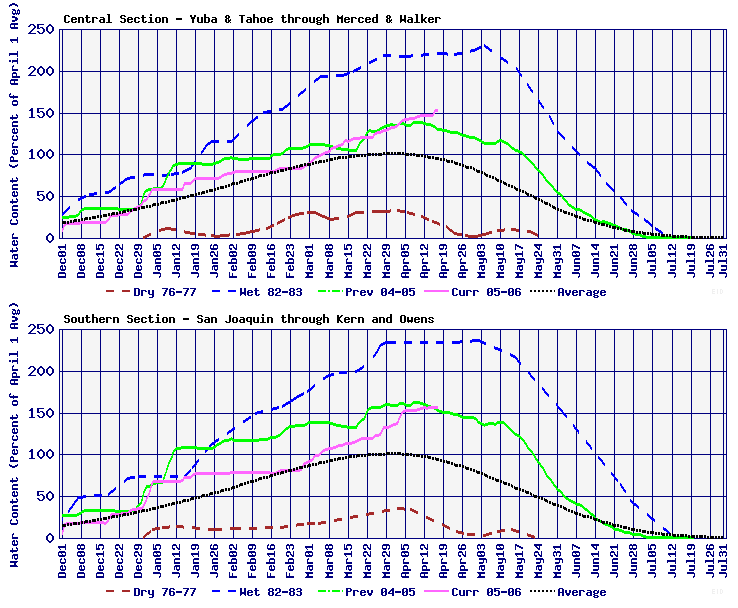 Also, given the cold origin of the March storms, a snowpack [Snow Water Content Graphic - courtesy of California Department of Water Resources] that was measured near normal on March 1 jumped to near 150 percent by the middle of April. In fact, the snow depth at Blue Canyon (Elevation 5280 Feet along Interstate 80) measured just 5 inches on March 1, peaked near 75 inches around the middle of the month, and ended up near 67 inches on April 1. To better illustrate the storm track across northern and central California during the month of March, a comparison can be made between monthly totals at major cities along the west coast. Starting April 2nd and lasting through April 6th, another cold system dropped out of the Gulf of Alaska and took aim at the west coast. This storm was stronger and moved farther south along the coast as compared to other systems that affected the region in March. 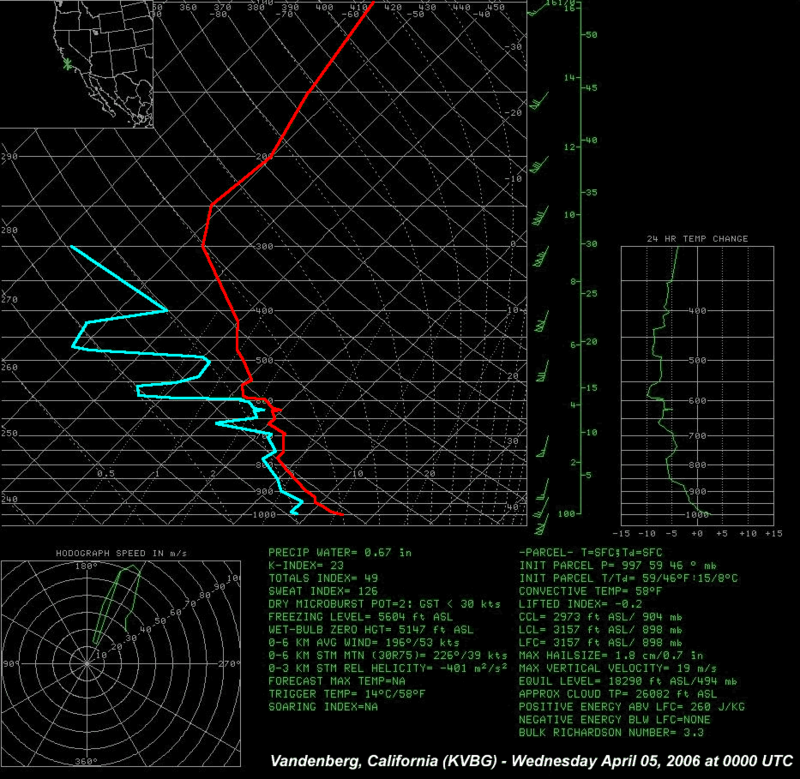 This allowed the system to tap into a warmer airmass with a higher moisture content before advecting over central and southern California. Warm rain processes resulted in efficient precipitation production and increased storm totals. Finally, the extremely slow progression of this system through the area allowed precipitation to focus on the San Joaquin Valley and adjacent Sierra Nevada foothills and mountains for a prolonged period of time. The next two tables depict storm total precipitation amounts for the 96 hour period starting April 2, 2006 at 5 AM PDT and ending April 6, 2006 at 5 AM PDT, while also providing a comparison to the monthly April average (1971 - 2000) for several locations in the San Joaquin Valley and southern Sierra Nevada. * Note: Giant Forest April Average is from 1931 - 1968. Included in the table below are the daily precipitation maps for the period starting April 2, 2006 at 5 AM PDT and ending April 6, 2006 at 5 AM PDT. Both gage (focusing on the San Joaquin Valley and adjacent Sierra Nevada foothills and mountains) and grid (California and Nevada) maps are available for each day. Also, a gage map depicting the storm total is available. 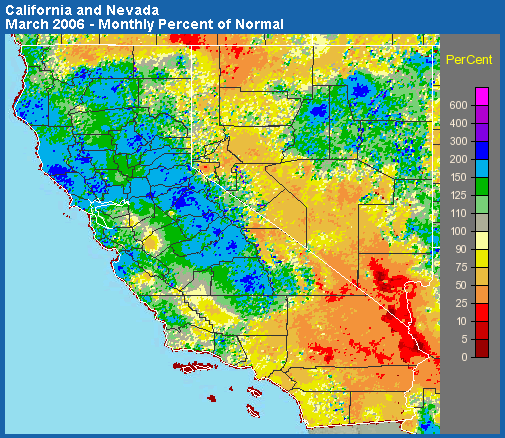 A rather persistent weather pattern for the month of March brought a prolonged period of above normal precipitation and below normal temperatures to northern and central California. These storms originated in the Gulf of Alaska and dove southeast toward the California coast before shifting inland. Cool temperatures accompanied these systems, bringing snow to elevations that usually do not experience an abundance of "winter-like" weather. 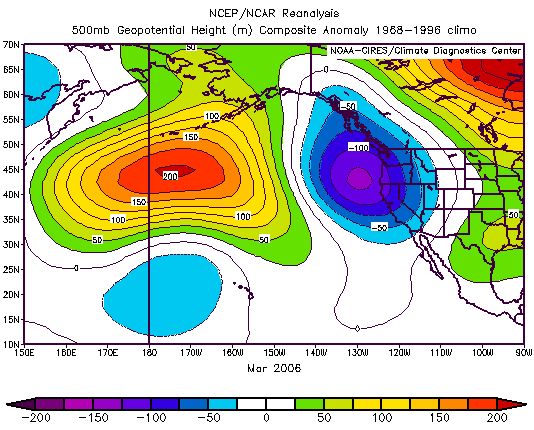 The map below (Figure 1) displays the 500mb height anomalies for the month of March, which indicates the below normal values (troughiness - wet and cool weather) across the west coast and eastern Pacific waters. 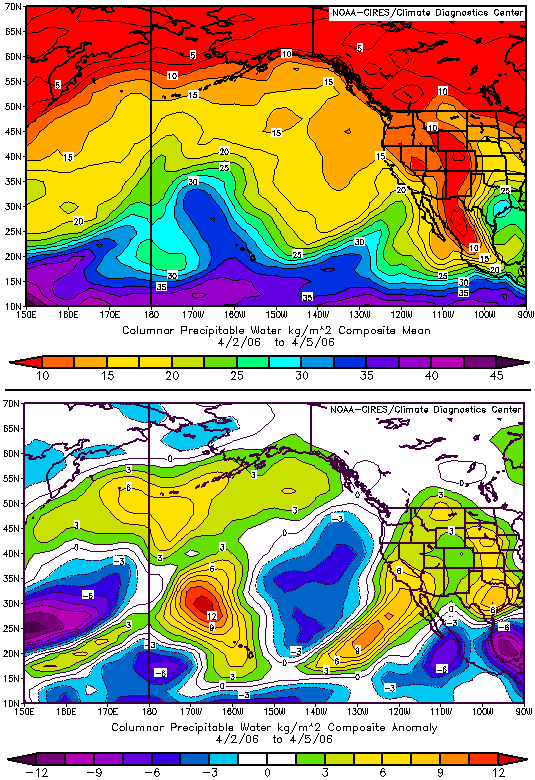 Also, note the well above normal anomalies in the central Pacific indicative of the highly amplified pattern, as well as the "Kona" low just west of the Hawaiian Islands. As the month turned to April, another storm developed in the Gulf of Alaska and began to dive south and east toward the west coast. While this system was part of the overall pattern now in place for over a month, what set this storm apart from the others was the influx of deep moisture from the lower latitudes. 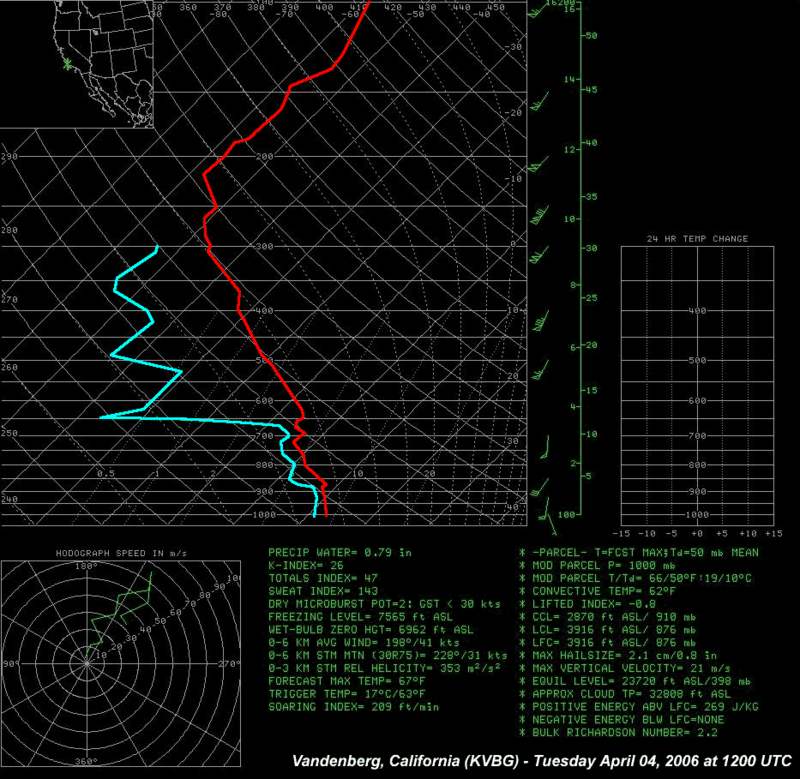 The schematic displayed below (Figure 2) depicts the synoptic pattern of the heavy precipitation event that occurred from April 2 - 6, 2006. First, an unseasonably deep upper low spun out of the Gulf of Alaska and settled slowly south along 130W. 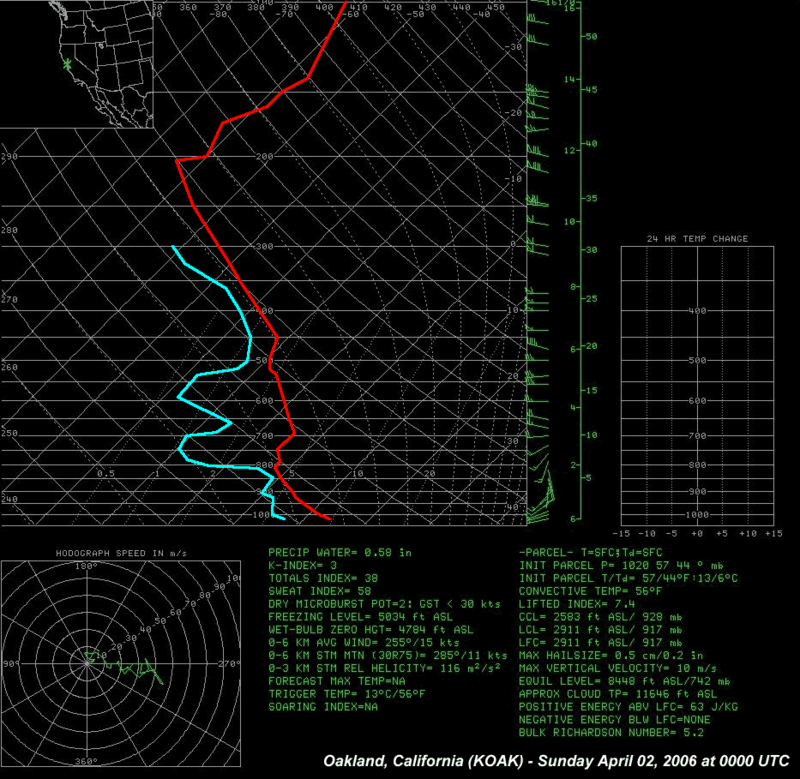 The highly amplified polar jetstream resulted in the slow progression of this system through the region, and a prolonged period of precipitation over the San Joaquin Valley and southern Sierra Nevada. 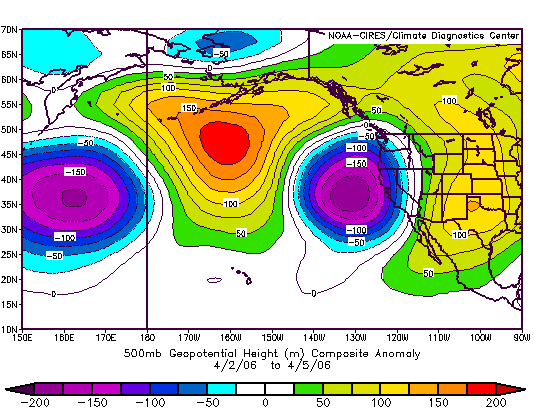 The 500mb height anomalies for the April 2 - 6, 2006 time period (Figure 3) shows this highly amplified and unseasonable pattern. 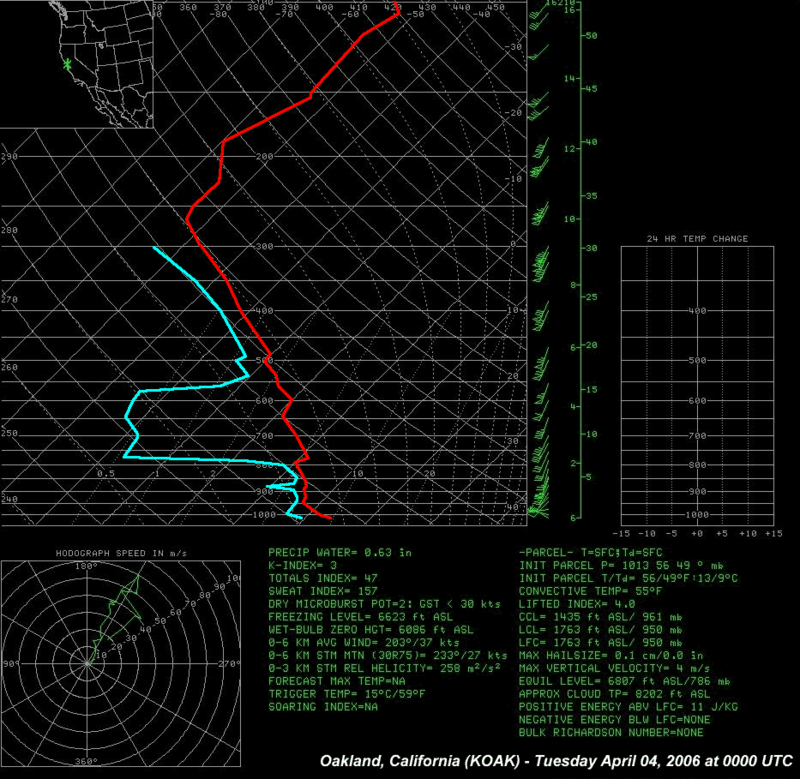 With deep south to southwest flow pumping a warm and moist airmass over the region, snow levels jumped to 10,000 feet over the southern Sierra Nevada. 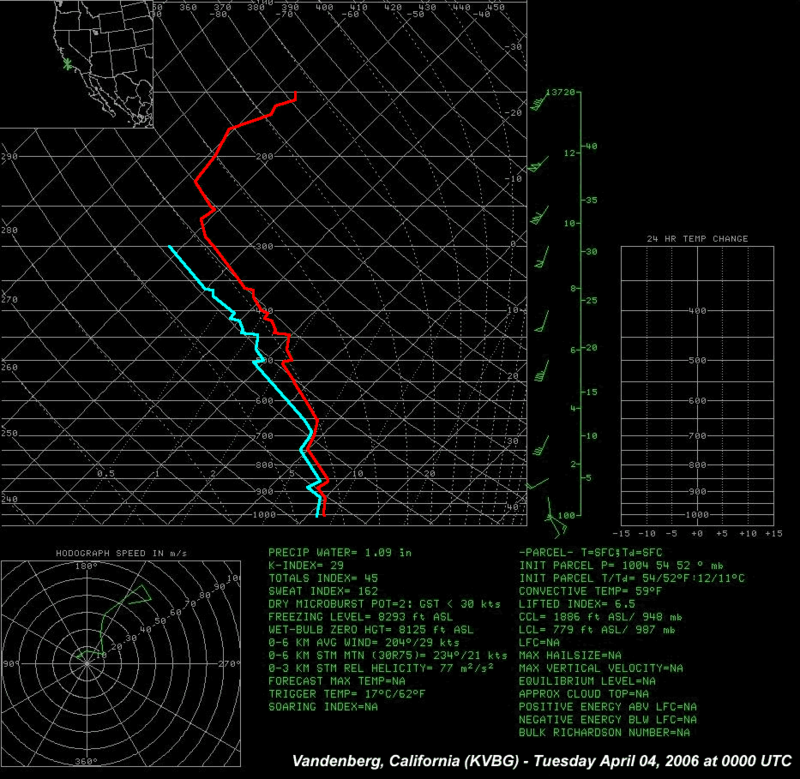 Also, efficient warm rain processes brought moderate to heavy amounts of precipitation during the 96 hour period ending April 6, 2006 at 5 AM PDT. This unseasonably deep upper low finally began to shift inland as another potent system began to dive south and east out of the Gulf of Alaska. With the system moving directly overhead, heavy showers and thunderstorms developed in the unstable airmass giving the region one last shot of precipitation. 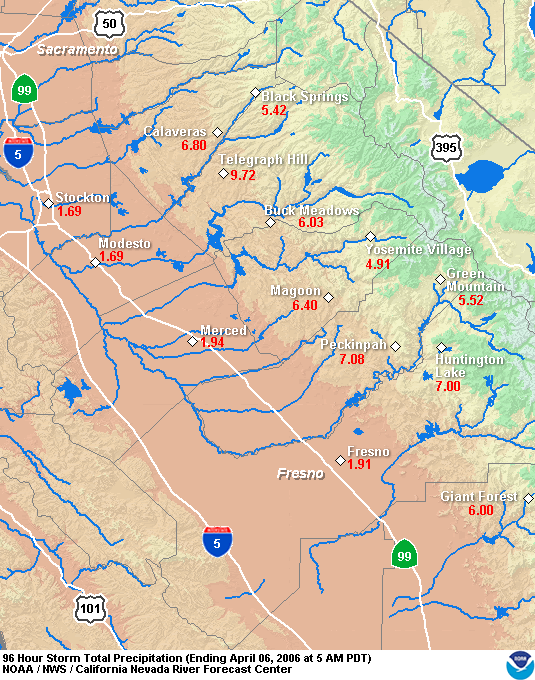 As previously mentioned, the next upstream system did generate some fears of exacerbating the flooding problems across the San Joaquin Valley and adjacent southern Sierra Nevada as the brunt of this storm originally looked to take aim on these already wet basins. Fortunately, a slight deviation in the system's path resulted in the band of heaviest precipitation from the San Francisco Bay area northeast over the Shasta Lake drainage and northern Sierra Nevada. 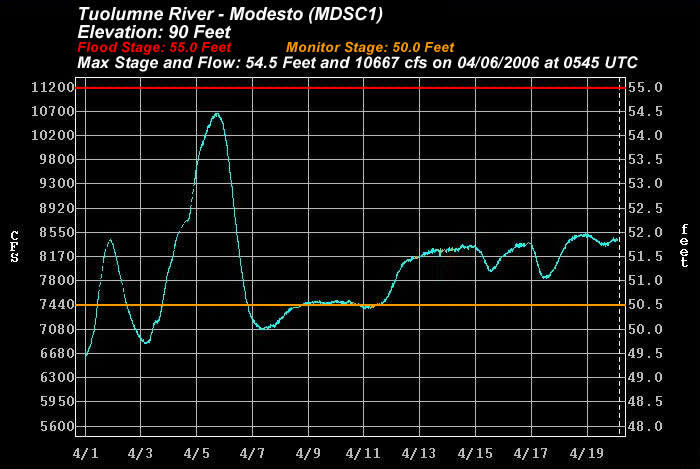 This storm resulted in a decent rise on the Russian River while also creating a renewed rise on the Sacramento River system. Also, inflows into reservoirs across northern California increased as well. Below are upper air and surface analysis loops created from images provided by the Climate Diagnostics Center (CDC). 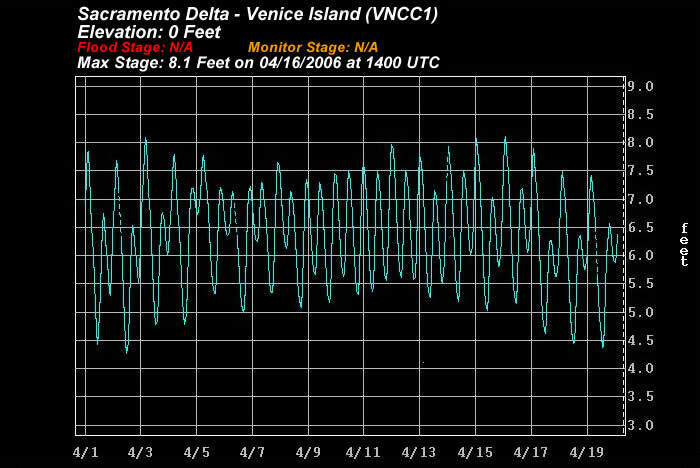 The loops are every 6 hours for the Apr 2 - 6, 2006 period. The 850mb winds loop shows the mid-level southwesterly flow over the southern Sierra Nevada, providing favorable orographics and precipitation enhancement. The 500mb heights loop provides a view of the deep upper trough developing off the west coast along 130W. The 250mb winds loop display the meridional polar jetstream and the interaction with the subtropical jetstream moving into southern California and northern Baja. Note that wind speeds shown on the images are displayed in meter per second (m/s). 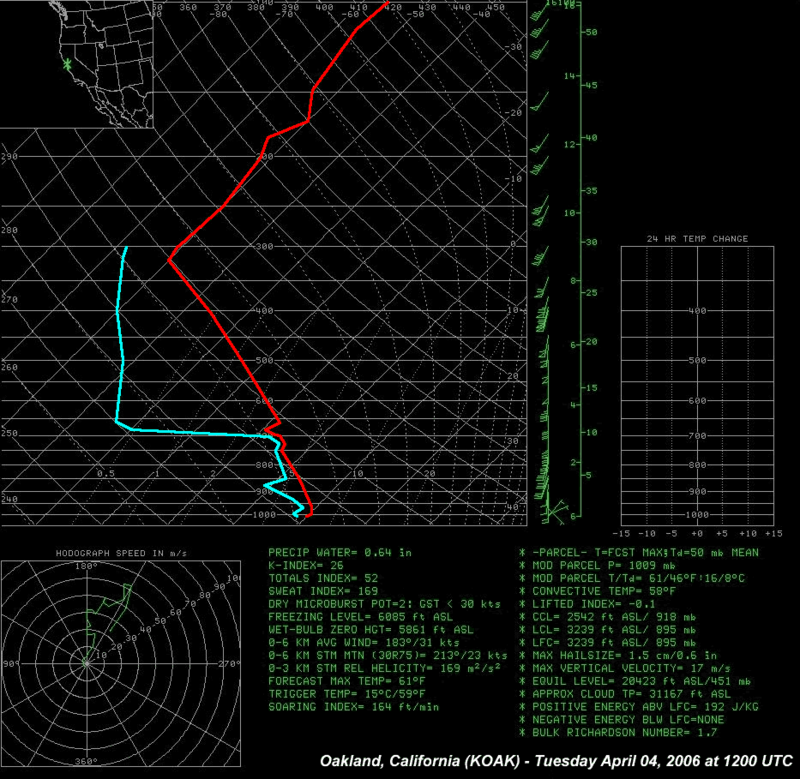 To convert to miles per hour (mph), multiply by 2.2.
steepened low-level lapse rates on the April 05, 2006 00 UTC soundings, indicative of an unstable atmosphere conducive to the development of showers and thunderstorms. 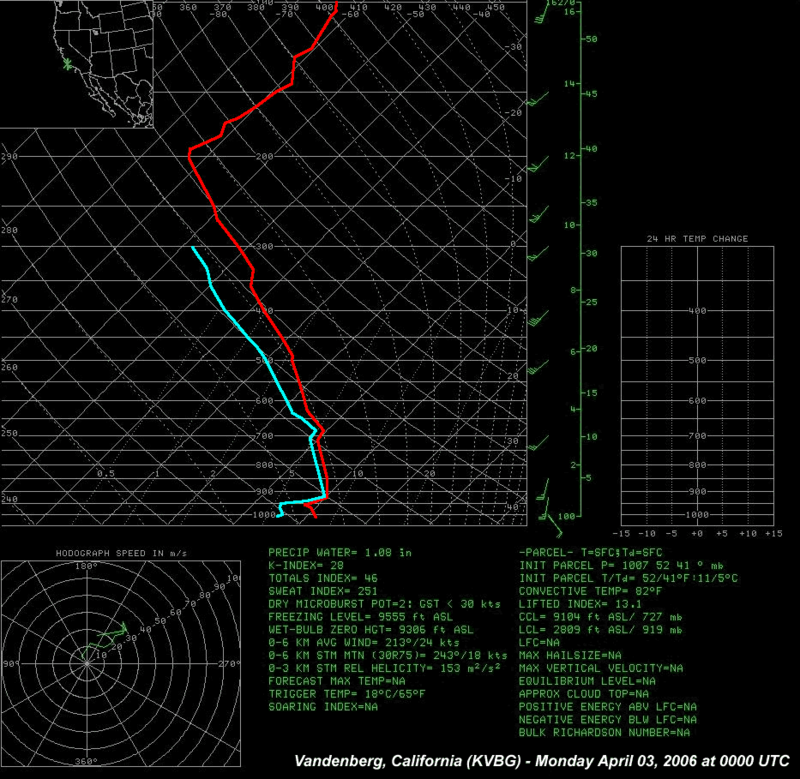 The following table links to NOAA - NWS NEXRAD (WSR-88D) imagery from 5 PM PDT on April 2, 2006 through 5 PM PDT on April 5, 2006. Radars in the mosaic include; KMAX (Medford), KBHX (Eureka), KBBX (Beale AFB), KRGX (Reno), KDAX (Sacramento), KMUX (Monterey), KHNX (Hanford), and KVTX (Ventura). 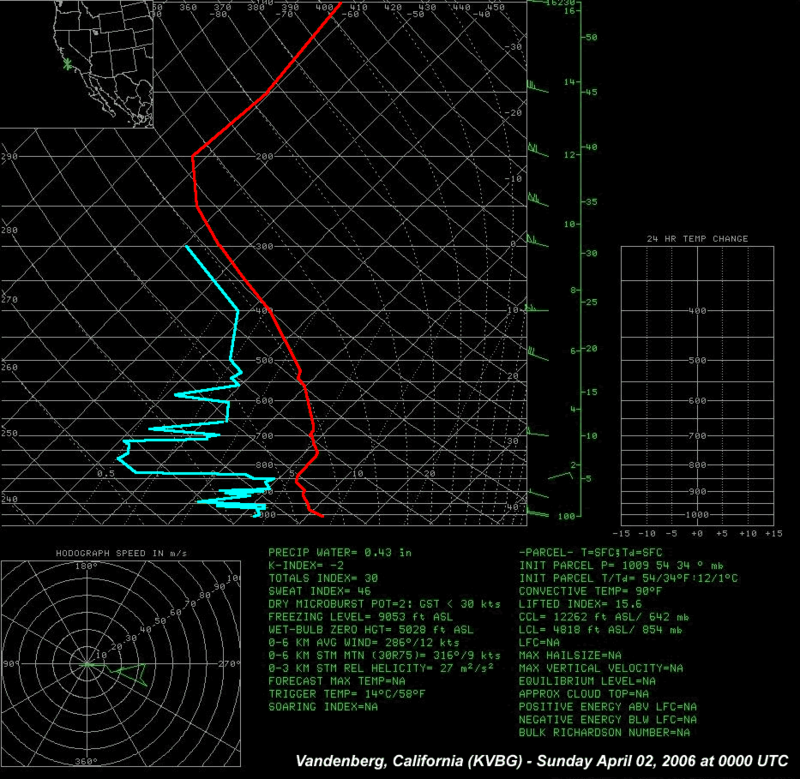 The radars display the persistent echoes streaming into the San Joaquin Valley and southern Sierra Nevada with the initial frontal band, the impressive showers and thunderstorms that developed on the afternoon of April 4, and more showers continuing on April 5 as the upper low moved inland. 15 minute lightning data is also displayed on the imagery in red (+ Positive Strike / - Negative Strike). The infrared and water vapor satellite loops below show the deep low pressure system that developed over the eastern Pacific leading to a prolonged period of moist southwest flow into central and southern California. After about frame 20 in each of the loops, the closed upper low pressure system opens into a trough and swings inland across central California, triggering heavier showers and thunderstorms across the same area as well as in the San Joaquin Valley itself, adding additional local runoff on top of the existing flooding. The final few frames show another system upstream that briefly appeared as another threat of heavy rain to the same area, but it ended up farther offshore and focused its heaviest precipitation into the San Francisco Bay Area northward to Shasta Lake. The precipitable water satellite loop below shows the two initial moisture sources on the verge of merging off the central California coast, before advecting over the region. 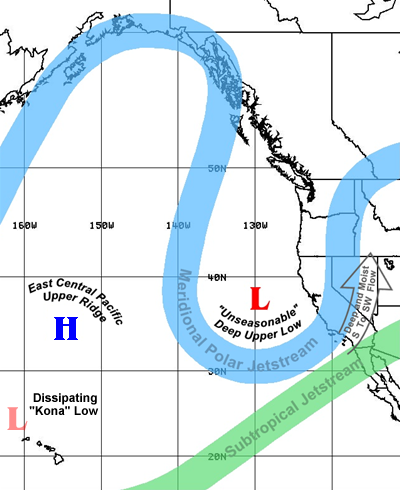 The northern source provided less moisture, while the southern plume had an origin farther south in the tropics initially drawn north by a "Kona" low before shifting toward the northeast with the subtropical jetstream. Values of 1.50 inches were recorded just off Point Conception, with amounts between 1.00 and 1.25 inches moving inland. The images linked in the table below show the snow levels calculated using vertically-pointing radar sensing profilers that measures fall rates of precipitation. This technology can only measure snow levels during precipitation. Gaps exist in the data because the sensors are located in the San Joaquin Valley, where the precipitation was more intermittent than in the Sierra Nevada. With the time scale from right to left, the images show the snow levels averaging between 8,000 and 10,000 feet early in the storm lowering to near 4,000 feet toward the latter part of the storm when the colder air associated with the upper low moved overhead. 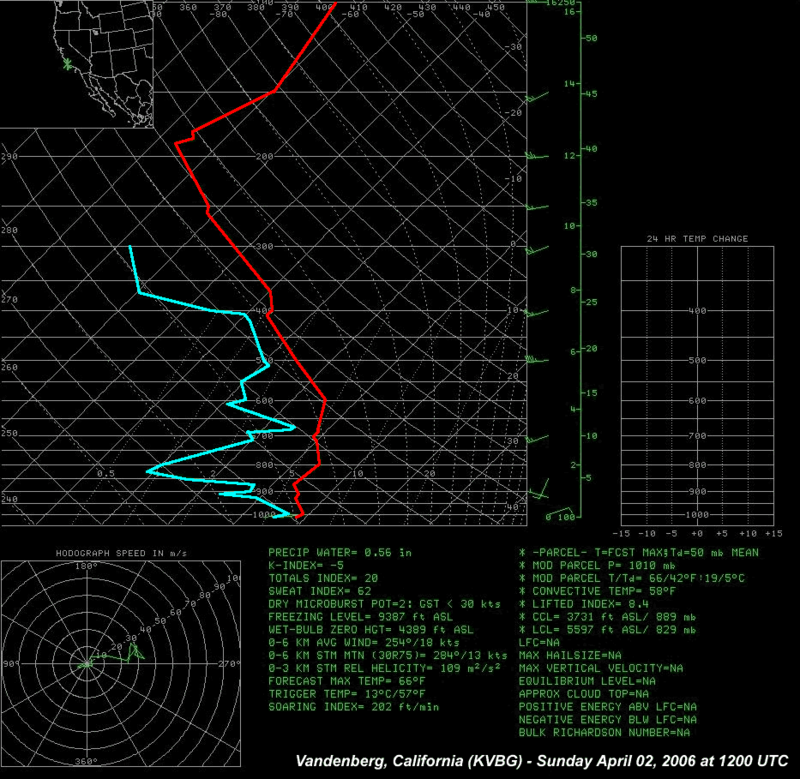 As a warm and moist airmass focused on the southern Sierra Nevada and San Joaquin Valley, a prolonged period of precipitation (April 2 - 6, 2006) and rather high snow levels (up to 10,000 feet) increased flood concerns across the region. With the majority of the precipitation falling as rain instead of snow, runoff volumes increased over the entire basin and entered reservoirs at a higher rate than is typical with colder storms.. Compared to the Sacramento River system, the reservoirs on the San Joaquin River system are generally smaller, but the more critical difference in this case was their limited ability to release water quickly because of restricted channel capacity below the reservoirs. Faced with rapidly filling reservoirs, officials were left with little choice but to release more water downstream as inflows continued high. In the following days, part of the San Joaquin River system exceeded design capacity (Chowchilla Bypass), increasing the strain on levees and elevating the risk of levee failures. 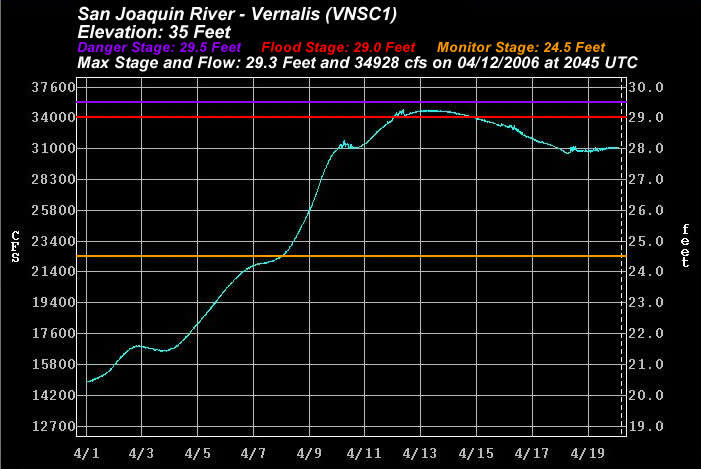 Also, particular concern was given to lower stretches of the San Joaquin River, where the river was expected to approach and possibly exceed its "Danger Stage" at Vernalis (29.5 feet). 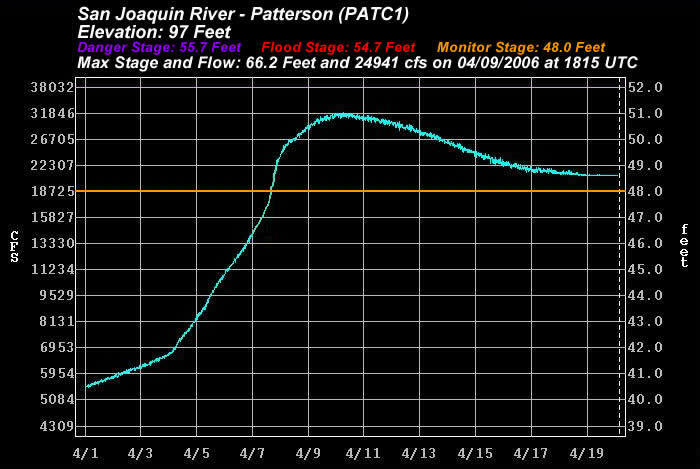 Fortunately the river crested at 29.3 feet on April 12, 2006 at 1:45 PM PDT, just 2.5 inches away from the "Danger Stage". Pro-active measures were taken to protect some of the more vulnerable levees, which included adding tarps covered with rocks to reduce erosion, and providing 24 hour crews to patrol the levees to keep a watchful eye for potential weak areas. Also, strong cooperation between numerous local, state, and federal agencies resulted in coordinated reservoir releases that kept flooding from becoming potentially worse. Several "flood fight" activities took place during the event, which involved numerous boils and bank erosion on some levees. Flooding was mainly confined to agricultural and rural lands, but some flooding of low-lying houses and road inundation did occur. Also, high waters forced the evacuation of several trailer parks along the river. 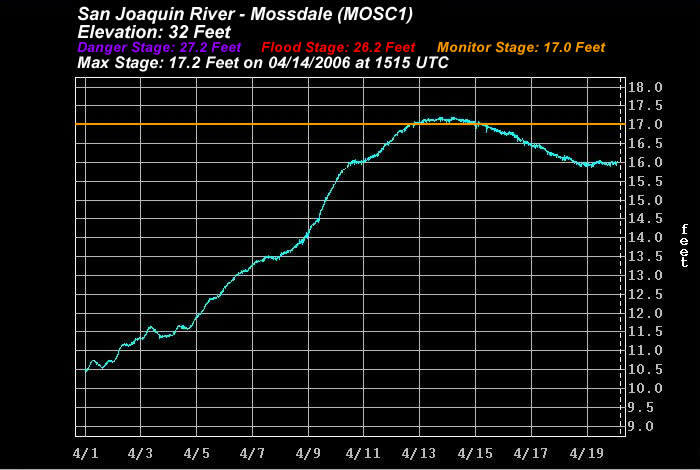 Just a short distance to the north, the Cosumnes River also experienced increased runoff from this prolonged precipitation event. With much of the basin's topography at lower elevations and snow levels running quite high with this storm system, almost all of the observed precipitation fell in the form of rain. 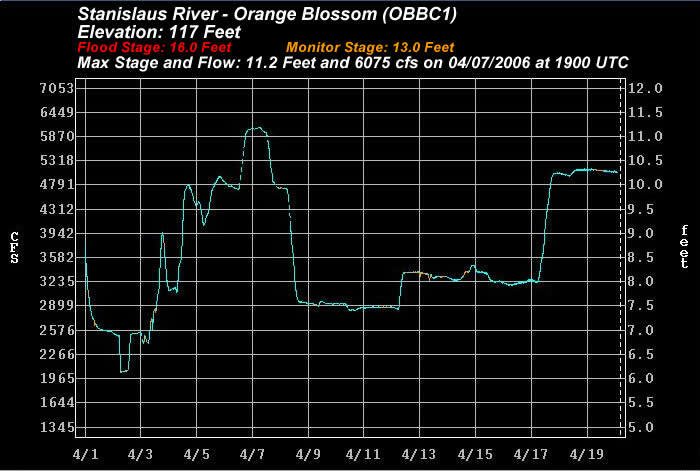 These factors resulted in observed flows on the Cosumnes River to be the highest ever for any April on record. 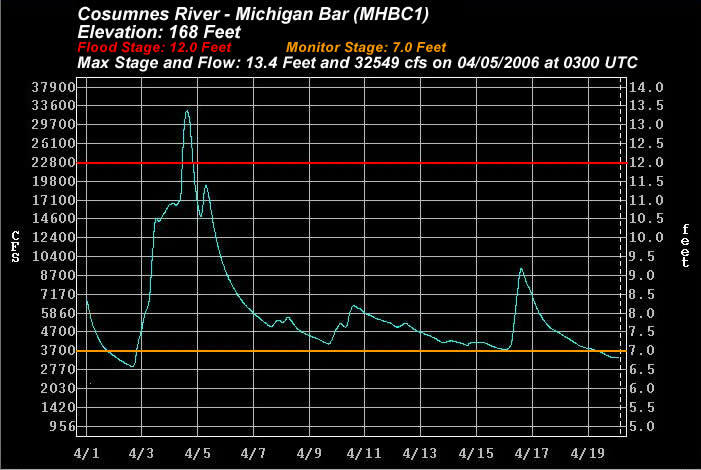 Also, with the river exceeding flood stage at Michigan Bar, it marked the first time since 1958 that the river surpassed 12 feet during the month of April. Increased flows traveling into the Sacramento and San Joaquin Delta region resulted in higher stages at several gages. 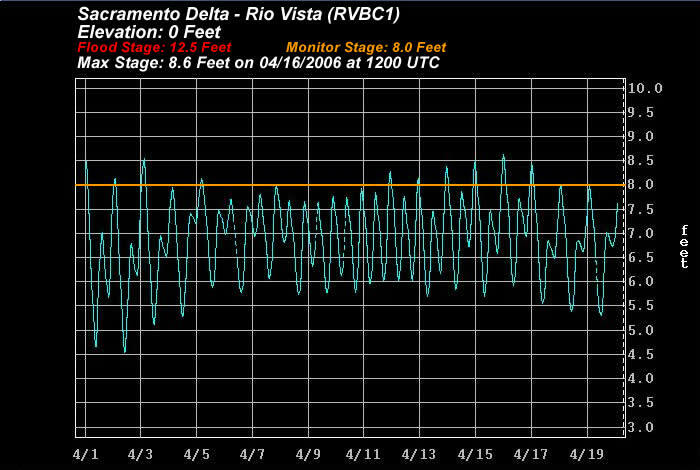 These high flows along with the high tides resulted in the location at Rio Vista to jump above its monitor stage of 8 feet during its peak high tide. 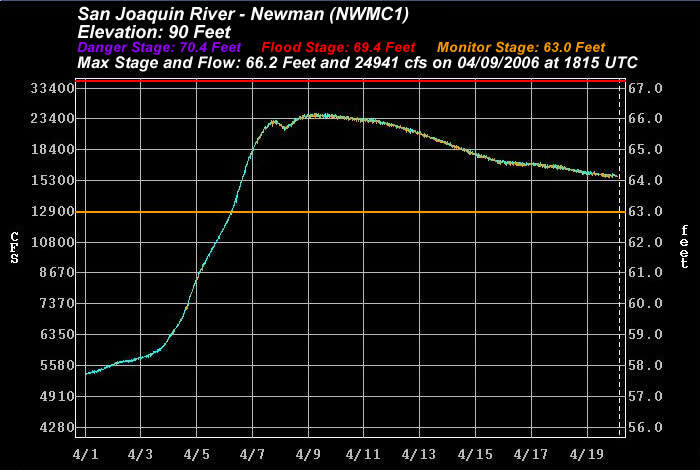 With the snowmelt season following just on the heels of this heavy precipitation event and the snowpack well above normal, high flows were expected to continue on the San Joaquin River system for quite some time. 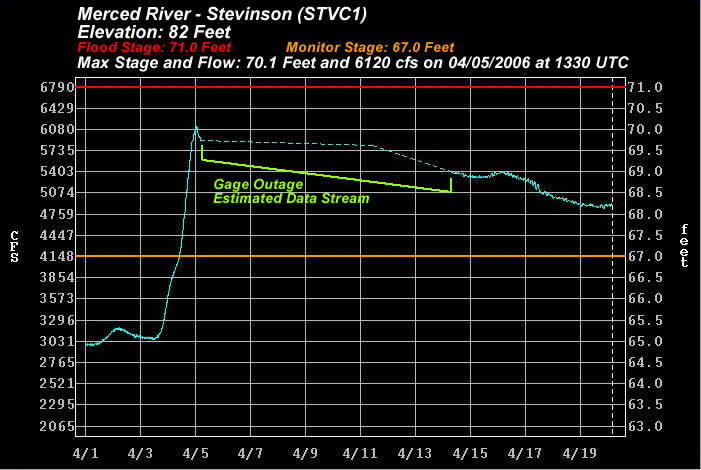 Releases from upstream reservoirs remained elevated to make room for the impending snowmelt, which usually peaks in late May or early June. The observed hydrographs listed below show the high stages/flows well after the heavy precipitation event due to the continued high releases from the reservoirs. The following tables represent locations across the southern Sierra Nevada and San Joaquin Valley where the California Nevada River Forecast Center (CNRFC) issues flood forecasts. 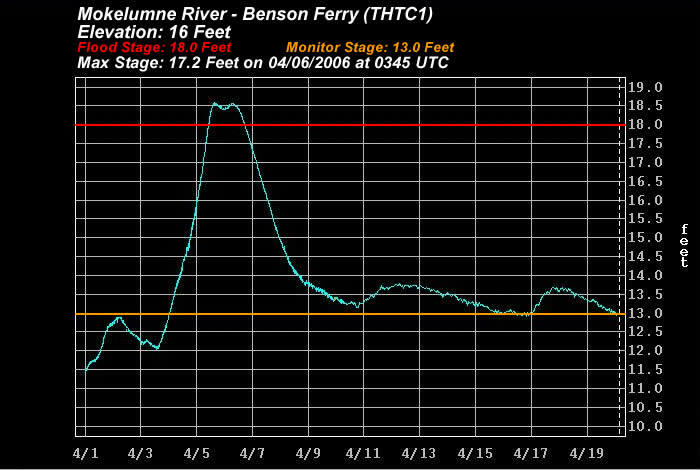 To view the observed hydrographs for the period of April 1 - 20, select the station location below.